I was on my way to the Post Office, the other day, happily carrying a pizza box and minding my own business, when a friend jumped out of a shop doorway. "I'll have a slice," he said. "Is it pepperoni?" Then he spotted the look on my face. "Hold on, that's not pizza at all. Is it? You are using the pizza box as a cunning disguise. There could be anything in there...are you smuggling?" Smuggling? No, just scrapbooking. I explained it to him, a little, and I think he got it because he grabbed his phone and started showing me his instagram pictures of his cats. Which just shows how many of us really are interested in recording things and photographing and taking note of what's going on around us. I haven't had a similar conversation on the return trip. Yet. The Postman has been delivering pizza boxes to our door for several years now and he has never questioned the lack of tempting cheese aroma or the coldness of the box. Maybe he's distracted by the big smile on my face. Whether it's a box of new supplies, or the return of a page or two from Scrap365, every pizza box is very welcome. Anyone else's postman show an interest? I admired that layout very much Sian, it is beautiful. Tthe journaling is great you summed up so much feeling in just a couple of sentences. I love this grey and white colour scheme with just a pop of yellow. Beautiful. I stopped getting pizza boxes quite awhile ago. But I don't think my postman ever gave it a second thought. I like the monotone quality of this layout--with just a splash of color. Never did use pizza boxes because I scrap digitally! If a pizza box is delivered to my door it is usually my husband bringing it back from take out. I don't really see my post man very often because he's a drive by, but I'm on a first name basis with my UPS man, Randy! He'll be delivering lots of goodies at this time of year. Who would ever have guessed that a pizza box would be the perfect size for scrapbookers? Well, you certainly are handy with the contents of those pizza boxes. Another fab page - I especially like those itty bitty letter stickers - yummy! Loving this monochromatic LO and the element of little squares. Yes, pizza boxes equal happy mail! I always have a stack of pizza boxes and find them handy for storage and stuff! I think by the time our postman [who looks about 80] has trudged up and down all the hills around here....he's unable to say anything!! The Post Office staff do sometimes look at me a bit oddly when I say I want 'real stamps' to put on mail art exchange envelopes. My postman never speaks to me. He just opens the doors of my car in the driveway and sit the packages on the seat. I keep mean to lock up my car sometime or other so he is forced to come to the door but I never remember to do so. We know our Postie very well, not through delivering pizza boxes though - that has only happened once ... I was spoilt for having an excellent real life store 5 mins away before I went digi! I forgot to say how much I really love this colour pallette - sigh, so restful and calm ... reminds me of my kitchen! With pistachio green rather than lemon. Beautiful layout & I had so much fun with that sketch! 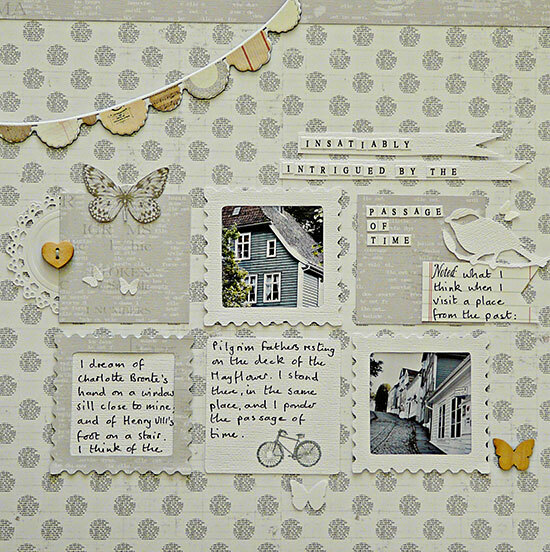 I was thinking how peaceful and calm this layout is too - it's beautifully done. Our postman occasionally stops me on my way down to school to let me know i've got a parcel and will i be in when he delivers it later on!! Never any mention of pizza though. Really appreciate the journaling as I feel the exact same way! It occurred to me as I read your post how much I envy that you can walk to your post office which, of course, provides opportunity for just the type of encounter you describe. We live in suburbia so we need to drive to almost anywhere we want to go. That, it turns out, insulates a body from a lot of human interaction. Still, there is hope. I was in a store the other day where I saw a man wearing a sweatshirt emblazoned with "Great Falls" the name of the town I grew up in. Contrary to my usual behavior, I actually commented to him and then ended up realizing that his shirt was an advertisement for the OTHER Great Falls, not the one I knew. Anyway, we had a laugh together and then went our separate ways. It really did brighten the day. Great layout, and fun post man story, Sian. This is such a lovely design. When I used to get Club Scrap, my post office was always interested in what was inside my pizza box. Don't get so much interesting mail these days. My monthly pizza box is delivered by the UPS man, and I'm quite sure he's never given it a second thought! Mine doesn't but maybe I don't get enough parcels? I need to rectify that I think! I did once get asked about it in the depot though when I went to collect one during a packed Christmas rush. I said "Its a pizza box" when they went looking for it and the whole crowd looked puzzled and there were murmurs and comments of "won't it be cold" and "funny Christmas present" etc! Love the look and feel of that layout! We don't get home delivery instead they drop it all off at a bank of mailboxes down the street so I wouldn't know what they are thinking when they try & fit them in the package mailbox. (: I should do a layout/story on that sometime.